What’s better than a dashing duke? A dozen of them! In this case, a baker’s dozen—thirteen of your favorite historical romance authors have come together to bring you more than a dozen tantalizing novellas, with one per month, for a year’s worth of never-before-released romances. January – The Duke in Winter by Alyssa Alexander — When the highwayman demanded he stand and deliver, he didn’t know she would steal his heart. February – The Difference One Duke Makes by Elizabeth Essex — Miss Penelope Pease is what every bright young thing never wants to be—ruined, thanks to an ill-conceived flirtation with the late Duke of Warwick. But ruined suits the new duke, his brother, Commander Marcus Beecham just fine—because after a career in the Royal Navy, he’s rather ruined himself. All it takes is one frosty night for two imperfect people to make the perfect February valentine. March – Discovering the Duke by Madeline Martin — Reunited at a house party after a lackluster start to their marriage, the Duke of Stedton attempts to win his Duchess’ heart. Will a sizzling wager be enough to melt the frost between them, or will it truly remain the coldest winter in London? 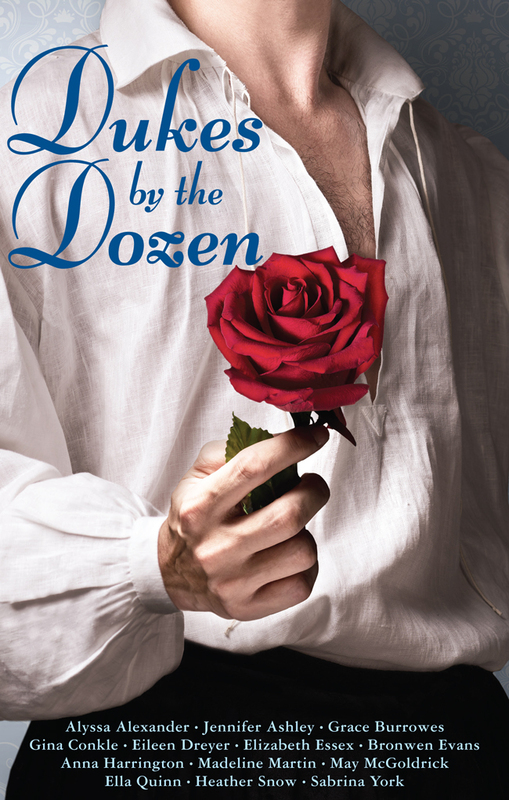 April – The Duke and the April Flowers by Grace Burrowes — The Duke of Clonmere must marry one of the Earl of Falmouth’s three giggling younger daughters, but Lady Iris—Falmouth’s oldest, who is not at all inclined to giggling—catches Clonmere’s eye, and his heart! May – Love Letters from a Duke by Gina Conkle — The Duke of Richland needs a proper duchess, but he wants his thoroughly fun, entirely inappropriate neighbor, Mrs. Charlotte Chatham. She’s widowed, older, and if the whispers prove true—barren. June – Her Perfect Duke by Ella Quinn — Still suffering over the loss of his wife and child, Giles, Duke of Kendal sees Lady Thalia Trevor at a market and is instantly smitten. There is only one problem. She is already betrothed to another man. Will she defy her powerful father to marry him? August – To Tempt A Highland Duke by Bronwen Evans — Widowed Lady Flora Grafton must be dreaming…Dougray Firth, the Duke of Monreith, the man who once pledged her his heart and then stood by and allowed her to marry another, has just proposed. While her head screams yes, her heart is more guarded. Why, after eight years, this sudden interest? When she learns the truth… can she trust Dougray to love her enough this time? September – Duke in Search of a Duchess by Jennifer Ashley — The meticulous Duke of Ashford is dismayed when his children inform him they’ve asked the young widow next door to find Ashford a new wife. Ashford can’t think of a more appalling assistant than Helena Courtland, gossipy busybody he steadfastly avoids. But Helena sweeps into his home and his life before he can stop her, turning Ash’s precisely ordered world into a chaotic whirlwind. December – The Mistletoe Duke by Sabrina York — The Duchess of Devon can’t think of a better way to tempt her widowed son into marrying again, than to throw a Christmas Ball. And there simply must be mistletoe everywhere! But it’s not until Jonathan meets his mother’s humble companion under the mistletoe, that fireworks erupt. January – Dueling with the Duke by Eileen Dreyer — When Adam Marrick, Duke of Rothray, shows up on Georgie Grace’s doorstep in rural Dorset, she thinks it is to acquaint himself with his cousin James’s widow and child. Instead the duke brings the news that Georgie’s four-year-old daughter Lilly Charlotte, whom James’s family disowned, has inherited a Scottish duchy. Unfortunately, the news has also brought danger to her door.